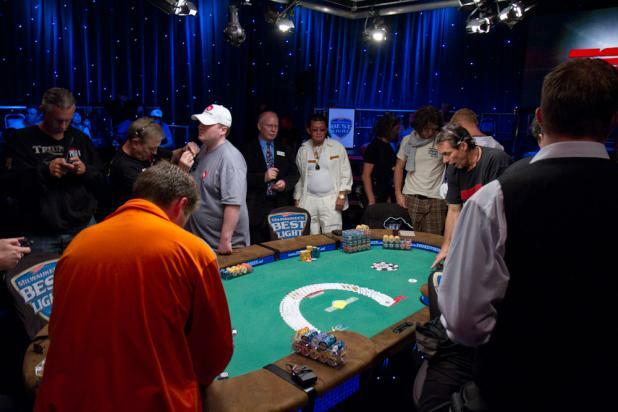 About 75 minutes into Day 4 of the WSOP Main Event, the Pavilion Room is down to the final two tables. 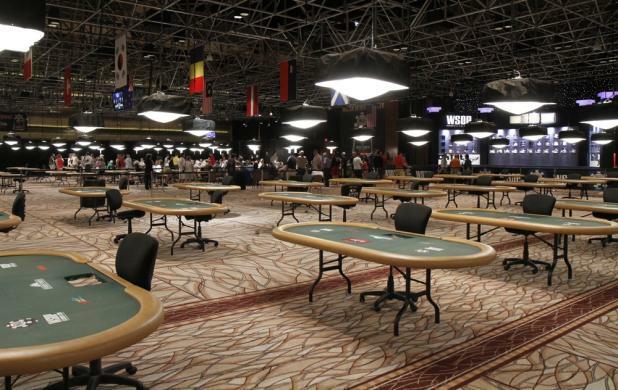 Once these tables are moved to the Amazon Room, this room will be emptied of spectators, cleaned, and prepped for its first non-poker usage in seven weeks. 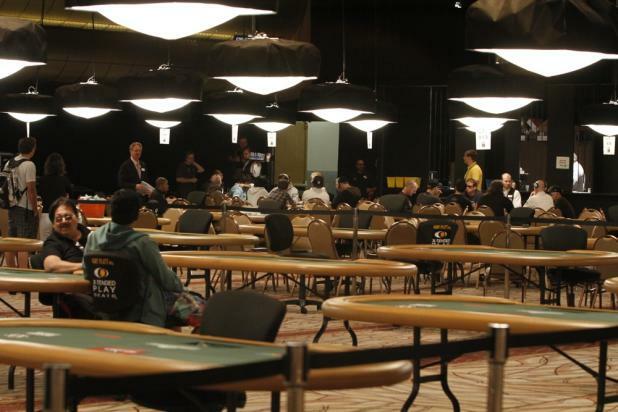 As the Pavilion Room empties out, fans might notice that players are never seen walking through the crowded hallways with their chips as they are moved into the Amazon Room. That's because players are led through the back corridors where access is restricted, accompanied by several tournament staffers to make sure no chips are compromised along the way. Here, Nikki Ivey (right) leads the broken table of Bruce Buffer (left) into the promised land -- the Amazon Room. About 15 minutes into Day 4 of the WSOP Main Event, Philip Goossons' last chip is moved out by the dealer to be used as one of the blinds. Goossons finished Day 2 with 98,400, and then had to fly home because he reportedly couldn't afford to stay in Las Vegas. His chip stack survived a little more than a day without him, but didn't last long enough to reach the money bubble. 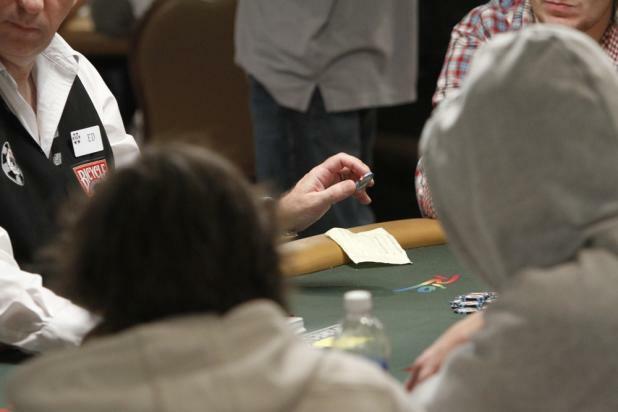 At the start of Day 4 of the WSOP Main Event, the Pavilion Room, which was once packed with players, is down to the final few tables. Most of the chairs have been removed, and the tables will be cleared out when there are no more players. Philip Goossons finished Day 2 of the WSOP Main Event with 98,400, but he never showed up for Day 3. His chip stack steadily blinded down, and there were rumors that he couldn't afford the few hundred dollars necessary to reschedule his flight. Goossons' stack managed to survive the day without him, finishing the day with 4,400 -- less than two big blinds. 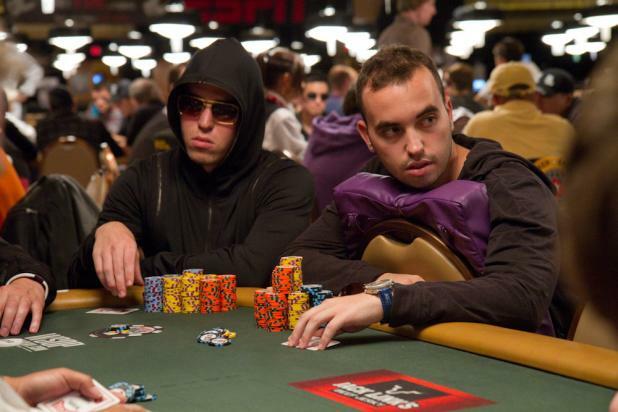 Brothers Tyler (left) and Bryn Kenny find themselves seated next to each other late on Day 3 of the WSOP Main Event. Anytime the ESPN TV table breaks, it causes a lot of confusion because one famous player stays on TV while the other players change around him (or her). 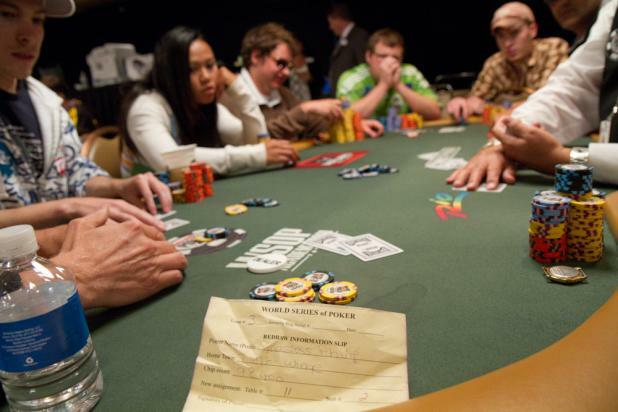 On Day 3 of the WSOP Main Event, the headlining player is Scotty Nguyen (center, in white), so whichever table he is assigned to temporarily becomes the TV table. When it's time to break that table, all of the players (including Scotty Nguyen) are re-assigned to new tables. Wherever Nguyen ends up, that becomes the new featured table, and those players (along with Nguyen) are moved to the TV table. 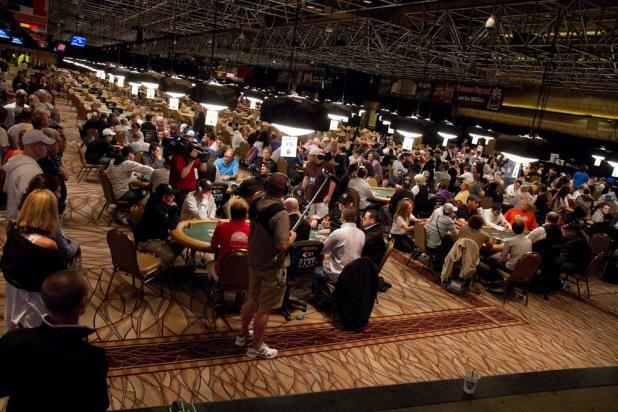 Late on Day 3 of the WSOP Main Event, the Pavilion Room is mostly empty tables as the remaining overflow is down to about 25 tables. Players will continue playing in the Pavilion Room until early on Day 4. 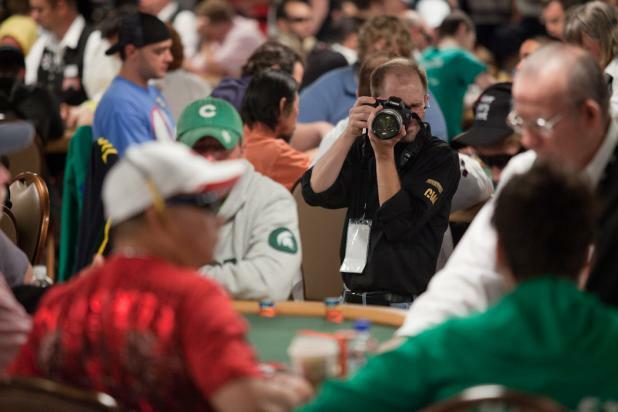 On Day 3 of the WSOP Main Event, your humble photoblogger BJ Nemeth (that's me) lines up for a shot of Johnny Chan. 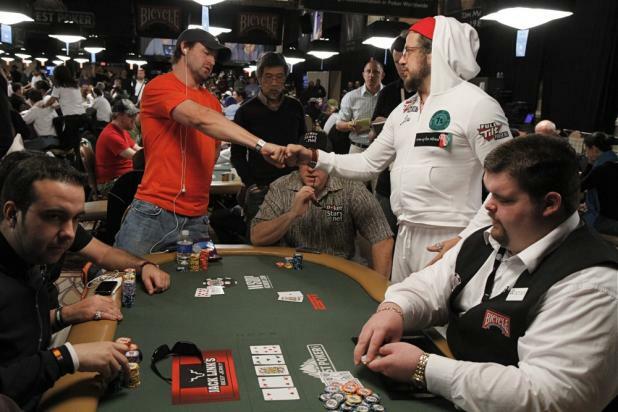 Actor/Producer Joe Reitman receives a fist bump from his opponent after doubling up during the second level of Day 3 of the WSOP Main Event. Reitman was all in preflop with A-K against K-10, and the board missed them both to double Reitman's stack to about 39,000 (24 big blinds).